“Cars that go more than 1,000 miles on a single fill-up and smartphones that can run for days without recharging are among the possibilities that could come out of a new Clemson University research project that brings together 3D printing and laser processing. Jianhua “Joshua” Tong and his team are working on a new 3D-printing technique involving rapid laser processing to create “protonic ceramic electrolyzer stacks” that convert electricity to hydrogen as a way of storing energy. The electrolyzers could have several uses, including as a fuel source in cars or to store energy generated from solar and wind power. 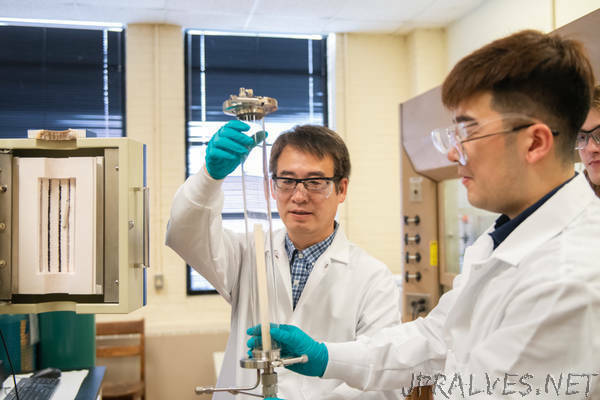 Tong, an associate professor of materials science and engineering, is leading the research with $1.6 million from the U.S. Department of Energy’s Office of Energy Efficiency and Renewable Energy. Tong’s project is the latest in a growing body of research aimed at using 3D printing to change how products are manufactured. In 3D printing, products are designed on a computer and then printed one layer at a time, the layers stacking on top of each other to create the product. The microwave-size 3D printers often found in high school classrooms print with plastic. One of the big challenges in advanced manufacturing is to figure out how to cost-effectively print with other types of materials. For Tong, the focus is on ceramics. When made conventionally, ceramics have to be sintered in a furnace at high temperatures, often for several hours. Different types of ceramics need to be sintered at different temperatures. An electrolyzer requires four different types of ceramics, making the sintering a challenge. In Tong’s project, a 3D printer puts down a layer of ceramic, and a laser sinters it at the same time, eliminating the need for the furnace. The technique would allow the user to 3D print an electrolyzer made out of four different types of ceramics without using a furnace. It would be similar to making a cake with many layers and having a different flavor for each layer. The technique could open 3D printing to new products and all the advantages that come with it. For example, a design for a car’s fuel-cell stack could be emailed to a factory thousands of miles away, and it could be printed within hours rather than waiting for days for delivery, Tong said. The project brings together four faculty members in Clemson’s Department of Materials Science and Engineering. Tong serves as the principal investigator on the project, while Hai Xiao, Kyle Brinkman and Fei Peng are co-principal investigators. Rajendra Bordia, chair of the department, said the research enhances Clemson’s efforts to help create more sustainable ways of converting energy. Anand Gramopadhye, dean of the College of Engineering, Computing and Applied Sciences, said the project builds on Clemson’s excellence in advanced manufacturing research.